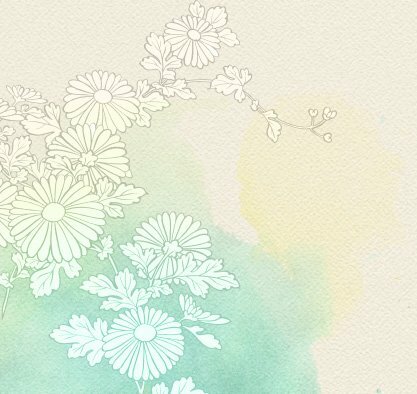 The Geisha Organic Facial uses traditional organic Japanese ingredients, such as rice bran, camellia oil, Azuki red beans, and peach moon water. However, the most crucial ingredient is uguisu no fun(powdered nightingale droppings), once a secret known only to kabuki actors and geishas. Geishas and Kabuki actors have traditionally worn heavy white makeup containing zinc and lead, which contributed to serious skin diseases and irritation. It was discovered that uguisu no fun completely removed this toxic makeup, while conditioning and soothing the skin. Although geisha makeup is no longer made with these ingredients today, uguisu no fun remains a Japanese beauty secret. At Ikeda Spa this ancient and prized geisha beauty secret is artfully revived in our Geisha Organic Facial™. Uguisu no fun is perfectly safe to use. It is sanitized through exposure to ultraviolet light before being milled to a fine powder. When combined with our unique 300-stroke Japanese meridian massage technique, it removes all traces of dirt and gently exfoliates dead skin cells to leave your skin soft, smooth and bright. You can’t go wrong with this time-tested facial treatment. UREA: Reduces water loss from the skin’s epidermis and retains moisture. GUANINE: Creates a shimmery, iridescent effect, giving skin a lovely glow. OGG1: Treats damage caused by UV exposure. Nightingale Droppings in your Facial, anyone? Yes, the secret ingredient in the Geisha Organic Facial is bird poo, and we love it. This signature facial uses 100% natural, organic ingredients, such as rice bran, camelia oil and azuki beans that have been used for beauty care in Japan for centuries. 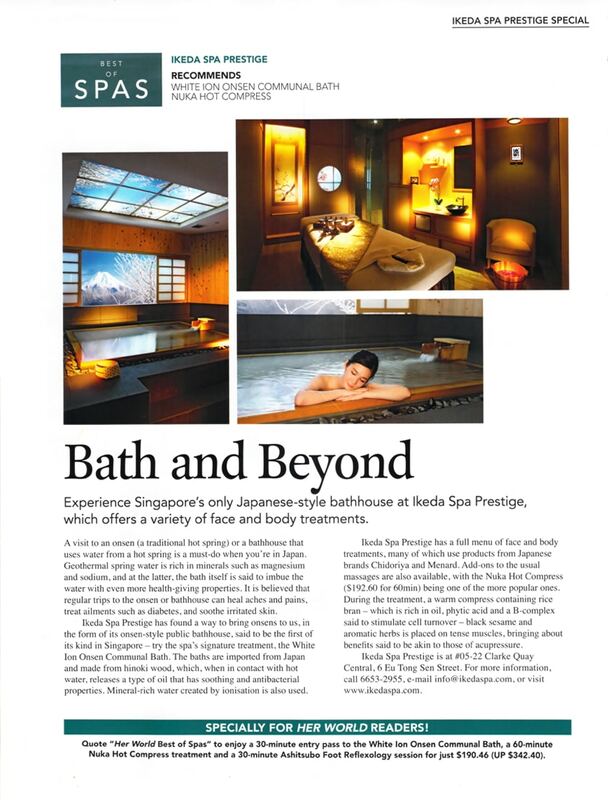 Getting the ultimate onsen experience need not involve a plane ride to Japan - Ikeda Spa will take you there. Lovely ambience and staff are really nice, very professional and no hard sale either to buy products or package. The facial was great with high quality products especially as I have sensitive/dry skin. I will definitely be going back …. soon! Excellent Geisha FacialHusband booked this facial as a Christmas present, and boy was this facial amazing! I have gotten facials at Capella Singapore, Aveda Paragon, L’Occitane Hong Kong, and at other various high end spas, but this is by far the best one I have ever been to. Service and such is fine. No complaints. No wow factor either. But the facial itself was impeccable. I forgot the name of the person who did my facial, but I walked out of there thinking and feeling that my face is clean! Pores clean, and skin glowing. It was surely expensive but it was totally worth it. I truly believe it was the nightingale droppings had a huge effect. This sounds gross but it has been cured to use as a facial treatment. I would definitely recommend this to others for the experience, and also to those who have the funds to go frequently. Excellent customer service. 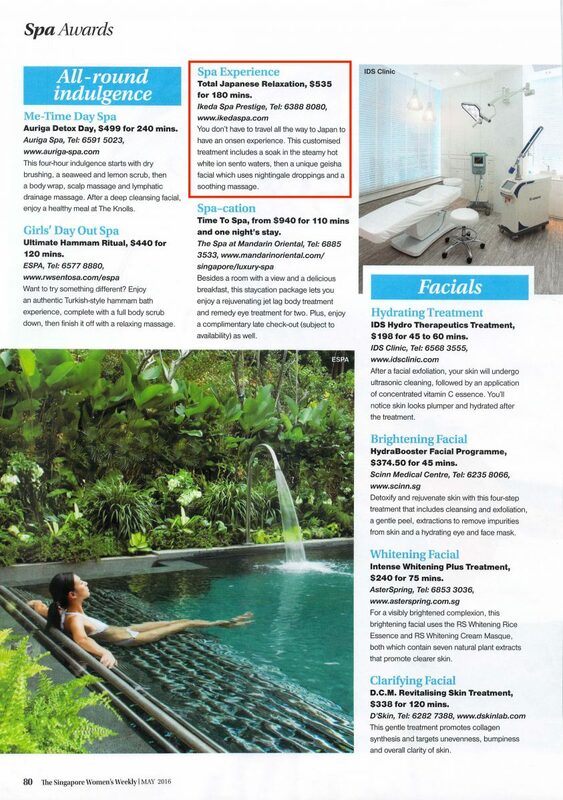 It was the first time I had a facial at Ikeda Spa in Bukit Timah Road and I must say it was excellent. The lady who did my facial was very professional and it was probably one of the best facials I have ever had.